Keen to feature my next real-life dandy and following in the footsteps of Yoshio Suyama, I was delighted when Lasse agreed to take part. Pour yourself a couple of fingers of your favourite drink and find out a little more about this dapper Danish chap. For me a Dandy is an aesthetic with a passion for quality and an eye for details. A Dandy is self confident and self contained. 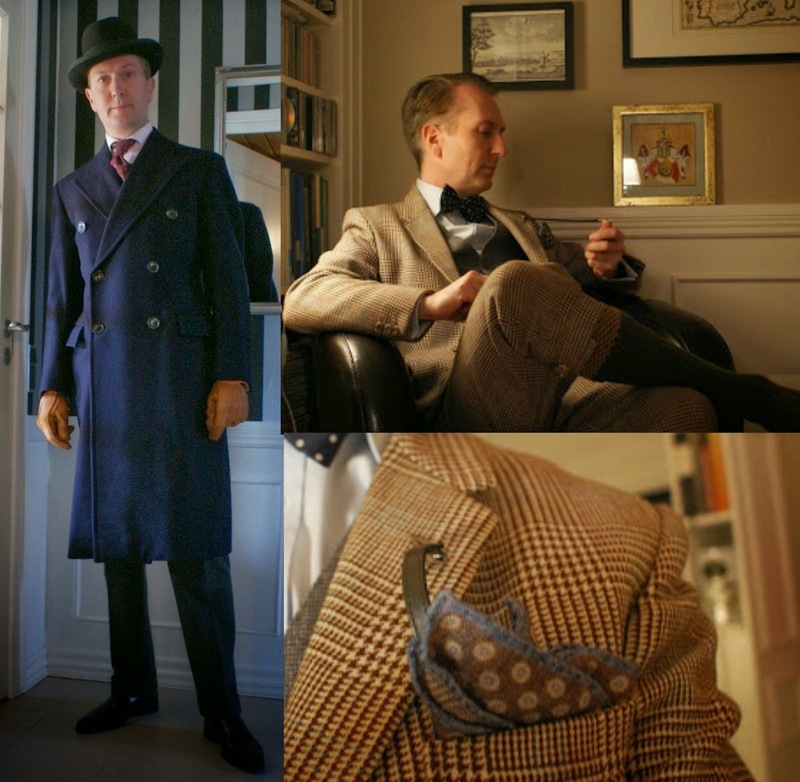 I am very inspired by the British Gentleman – dress well and according to the situation. My wardrobe mainly consists of vintage suits, jackets and hats. I would definitely choose the inter-war period – 1920 to 1935. A lot happened in Britain with the gentlemen’s attire in that period: the Edwardian black tail coats were supplemented with shorter jackets; the lounge suit emerged; the numerous ties and bow ties won terrain. A period in Britain that still is the base for modern men’s attire worldwide. My favourite item is my vintage 1955 bespoke three piece Prince of Wales check flannel suit by Savile Row tailors Meyer & Mortimer, London. 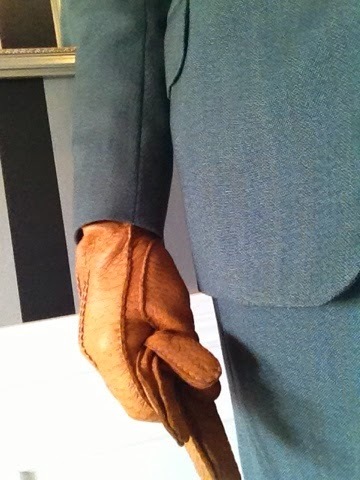 The suit was originally commissioned by a British Major. The suit emphasises the Dandy: the craftsmanship in the tailoring and stitching, the quality of the fabric, the vivid colours, the versatility and the fit. 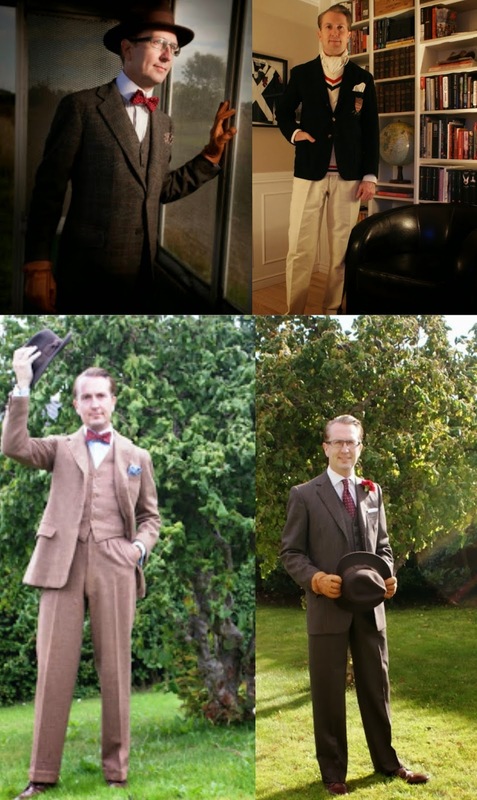 I had my calling two years ago, where I bought my first vintage suit. I have started this journey to dress gentlemanly from scratch; I grew up in the anti-authorities-1970s with semi-hippie parents. My purpose was to dress as a grown-up and to use good quality materials and local (European) suppliers. 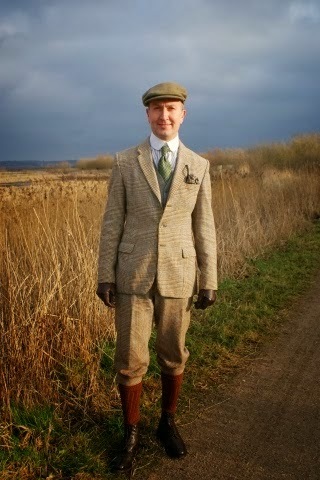 I dress appropriately; when in the country side I wear tweed – preferably breeks. 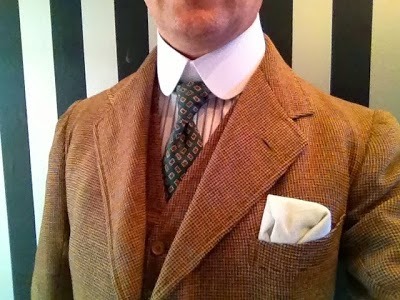 At home I omit the suit jacket; wearing shirt and waist coat or adding a slipover or jumper. 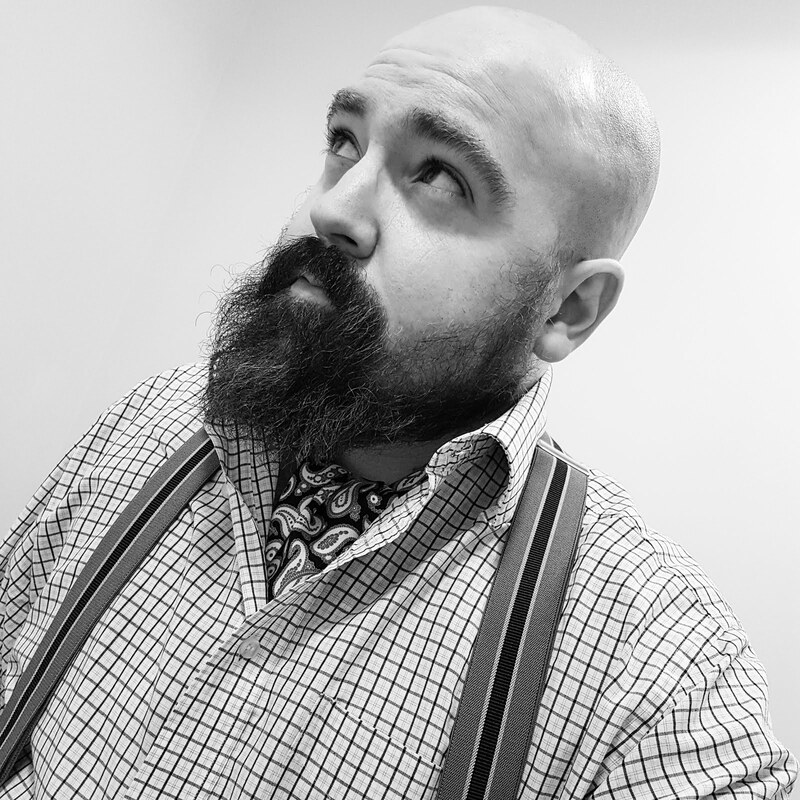 I usually wear tie or bow tie also at home, but sometimes I wear a cravat instead. 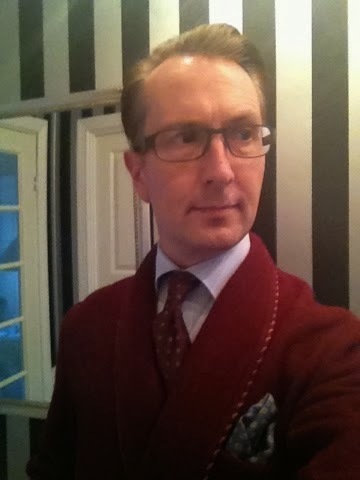 In the evening (at home without guests) I would dress in pyjamas and dressing gown – combined with a cravat. And when running I wear trainers, shorts etc. Dressing appropriately implies taking into account the needed periods of rest for the suits, shoes and ties. For example, a flannel suit should rest for at least two days in between wearing. Furthermore the various fabrics and materials in the ensemble should somehow match: a sturdy Harris Tweed jacket is better matched with a wool tie – or a Shantung silk. And not a 36 oz Foulard. 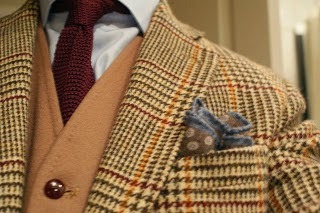 And a brown full brogue matches maybe the versatile town and country suit, but not the charcoal city suit. Experience makes you capable of picking the perfect match almost blindfolded. But dressing well takes a certain amount of planning and coordination so the periods of rest are respected and you do not appear in the same ensembles too often. 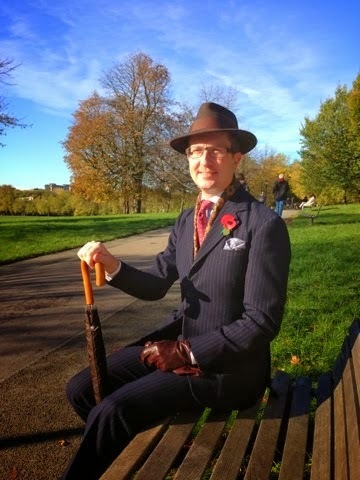 My suits are mainly vintage – from chap outfitters like Savvy Row and the former Bookster.uk. Ebay.uk have many serious vintage clothiers like Kompendium, Victory Vintage etc. You have to know your exact measures to buy vintage clothing online – and a local alterations tailor. 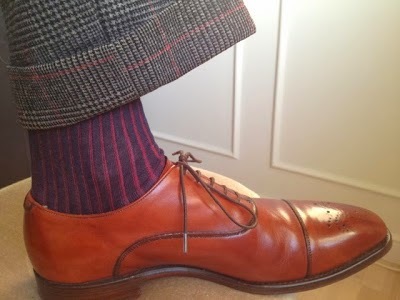 Combined with contemporary exquisite trimmings from Stenström’s (shirts), Bresciani (socks), Drakes (ties) and Thurston (braces). And good year welted shoes from Cheaney & Sons, London. I also acquired several items from British period outfitters Darcy Clothing; e.g. the magnificent detachable stiff collars. People tend to react positively to my appearance. Commenting the ties, pocket squares, the shoes, but mostly praising the overall look. A thing that struck me several times is the respect people show a well-dresser; most men would not dress like this, but they appreciate the effort. In the public I have experienced cars stopping and cameras emerging from the car window. I am inspired by people who are passionate about their profession, their hobby, their appearance. 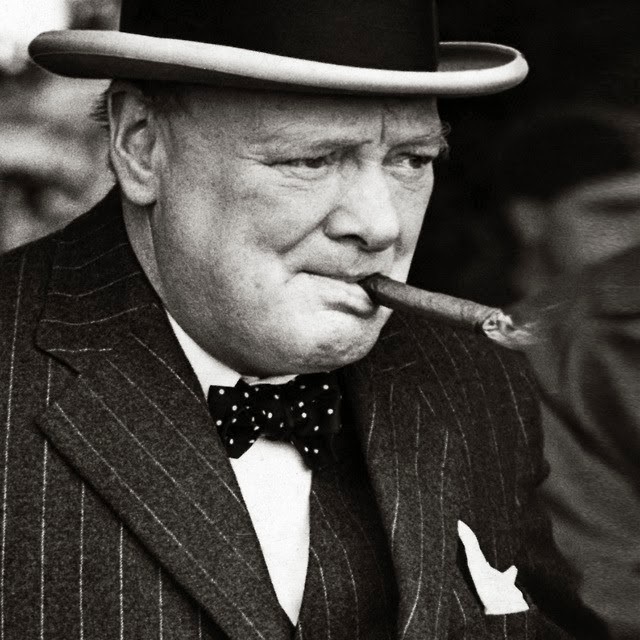 Sir Winston Churchill is a great inspiration – a gentleman, a passionate believer in right and wrong, a man capable putting his will through; And a great dresser – maybe not dressing to impress, but dressing appropriately. Huge inspirations attire-wise are men like Sir Anthony Eden, Cary Grant, Fred Astaire. But I must admit that my single most used source of inspiration is the fictitious gentleman Bertram Wilberforce Wooster as depicted in the 1990s ITV production ‘Jeeves & Wooster’ by actor Hugh Laurie. 11. There are lots of sartorial rules, it seems. ‘Never brown in town’ and ‘don’t wear a matching tie and pocket square’. Do you follow any rules? I see most of the rules as rules-of-thumb if in doubt. Dressing well is based on experience watching hundreds of combinations of colours and materials. And for the inexperienced the rules makes life easier – they are based in common sense in my opinion. E.g. ‘no brown in town’ makes it easier to remember that in the city grey or blue suits are more appropriate as tweed is meant for the country side and white or cream cotton or linen suits meant for the summer vacation – a rule that leaves the sturdy brogues, the spectators and the white bucks out of the city. I try to dress according to my pursuits and the weather and therefore I inevitably will follow more rules. But a nice espresso brown oxford or munk shoe matches a navy suit perfectly and should in my mind be worn in town. 12. 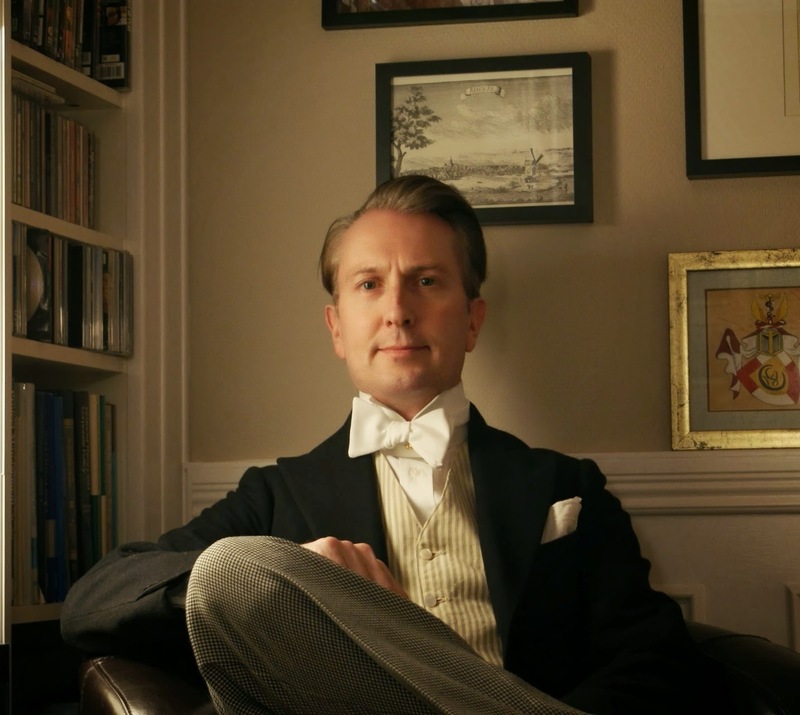 You write a rather magnificent blog, chronicling your gentlemanly attire. What made you start writing it? I started my attire chronicles because I wanted to share my findings – the suits, the history, the fabrics and the colours – with fellow-minded chaps. Also hoping to inspire other men to making the effort of dressing well. I chose to write in English for two reasons: I am very inspired by the British gentleman and as English is used in large parts of the world I am able to share my passion also with people abroad. A gentleman is educated, tactful, able to see things in a broader perspective and able and willing to take responsibility to help others by using his knowledge and skills. I wear pocket squares every day. Hats and caps are worn too seldom in public nowadays – I find them very becoming and practical. After the initial second thoughts I have grown very fond of my Fedoras, my bond flat cap and my Homburg. Many days I also wear my antique pocket watch – with a single Albert silver chain and fob if wearing a three piece suit or attached to a military style leather strap if wearing tweed. Well, there you have it! If you consider yourself to be a delightful dandy and would like to be featured, please do send me a missive. Now, scamper over to Lasse's periodical post-haste. A superbly written interview, with a thoroughly interesting chap. I shall certainly peruse his blog at another time. A most worthy read, dear lady! I shall cast my eye over your blog too, starting with your latest on gin. May I also recommend another weblog - the splendidly named, Institute for Alcoholic Experimentation. Oh splendid, I shall look that up.